Q: Why do I need Good Sam RV ERS? need of roadside assistance and towing. They contract with the best, most efficient and professional RV towing and repair companies in the US and Canada to ensure that your vehicles are handled properly and safely. Q: Who is protected under the Emergency Road Service program? A: The Good Sam Emergency Road Service member, the member's spouse, and any dependent children 25 or younger living at home or attending college. Q: How long will it take for Emergency Road Service dispatch to arrive? A: Emergency roadside assistance averages between 45 - 60 minutes. However, when you call for roadside assistance, a service representative will be able to give you an accurate estimated time of arrival. Good Sam RV ERS guarantees quality, on-time service when you need it most. Q: How do I use my Good Sam Club Emergency Road Service membership? A: Simply call the dispatch phone number that has been provided to you. This number can be found on the back of your membership card and on your member benefits brochure. 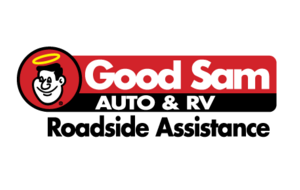 Learn more about the Good Sam Emergency Roadside Service Program. What's the difference between this and the Extended Warranty offered by Good Sams Club? Copyright 2016 Funroads. Powered by Blogger.